Maybe I’m getting a little ahead of myself calling this a winter dish, but in my experience when it’s a top of 2°C/35°F, it definitely feels like winter. The colder months have always posed a conundrum for me. I’m never short of soups, hearty braises and comfort food for lunches and dinners, but it’s breakfast that I’ve never quite figured out. Coffee is a must, and toast is kind of warm but I can’t do cereal and cold milk or muesli and yogurt in winter, nor am I a fan of warm oatmeal or porridge, and thus I was at a loss. 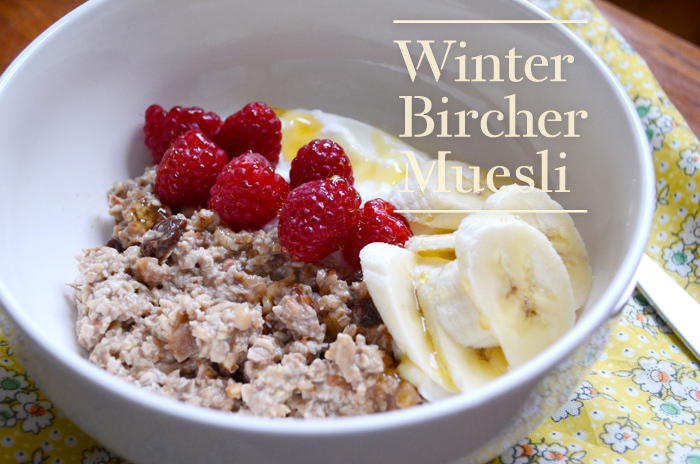 But this year, I’ve been making bircher muesli after I read that you can serve it cold or warm, and it’s the easiest thing in the world to make. 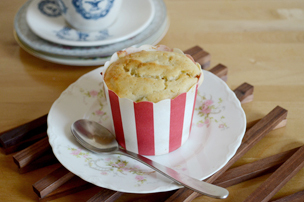 It’s pretty much an assembly job and I wouldn’t be blogging it as a recipe unless it was such a revelation to me! Served warm, it is a little bit like oatmeal but with more interesting textures and chunks which I like, plus I really need the extra calories in the cold weather! 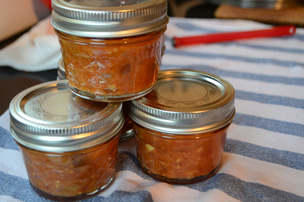 This recipe is also really healthy with no added sugar, and I like to serve it with a little bit of honey. Traditionally bircher is made with apple juice, but you can make this with almond milk as well which is a little bit richer and nuttier. I go through this tub in less than a week, but if you don’t eat it every day I would suggest making a half recipe, it keeps in the fridge for up to a week. 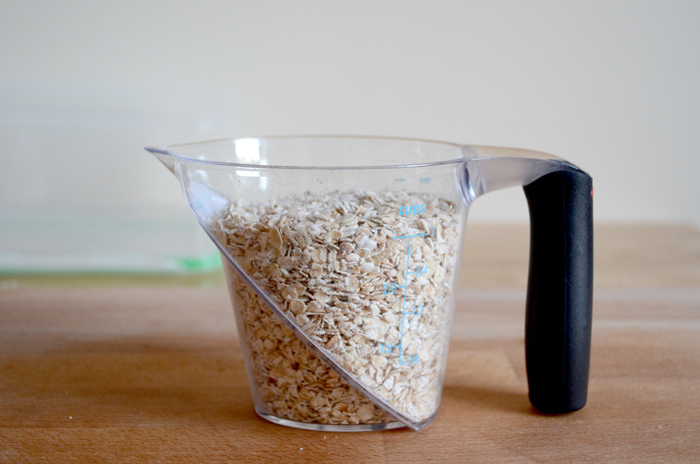 Measure out two cups of instant or rolled oats. 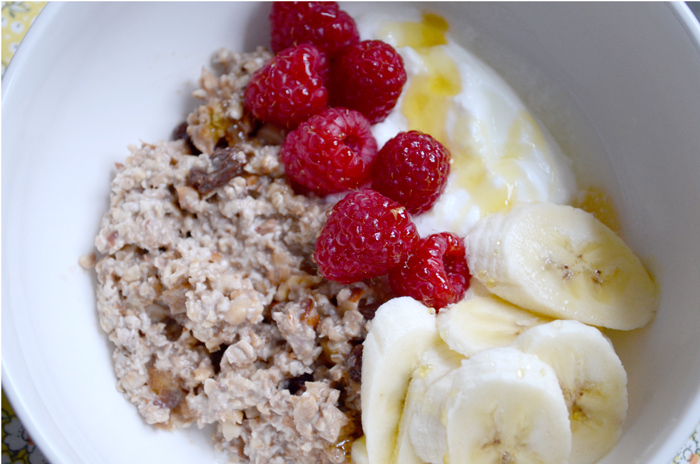 If you like a firmer texture, you can use rolled oats but I like how absorbent the instant oats are. 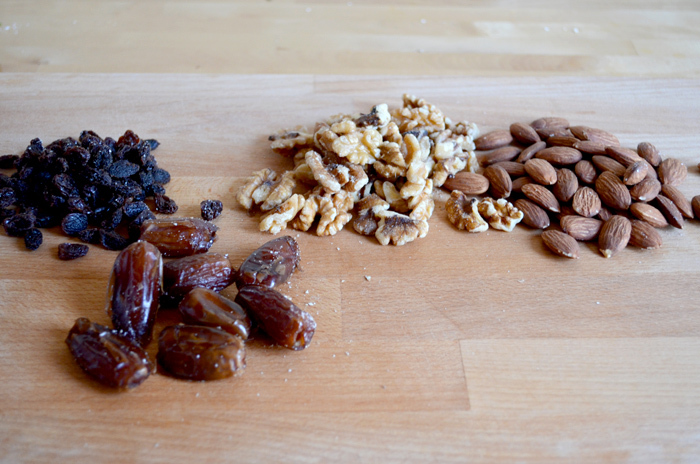 Weigh out small handfuls of almonds, walnuts, raisins and dates. You can pretty much use any fruits and nuts, but if you are omitting the dates I would add a dollop of honey as the dates are the main sweetener in this mixture. Pumpkin seeds, pecans would be great in this too — I would suggest figuring out your favorite mixture and “wetness level”. 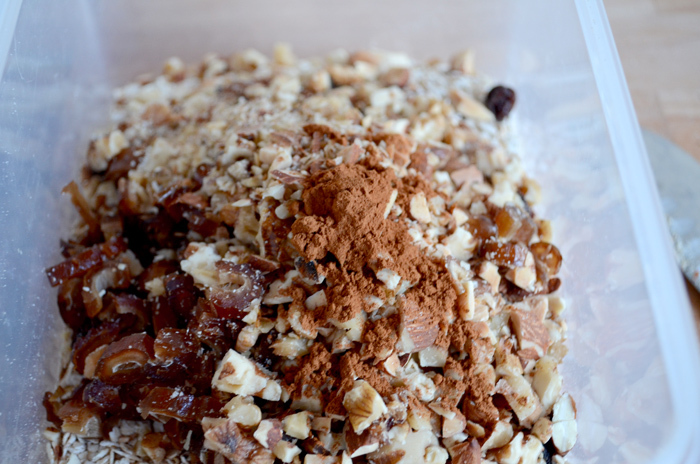 Chop up the nuts and dried fruit, or blitz in a food processor if you have one. 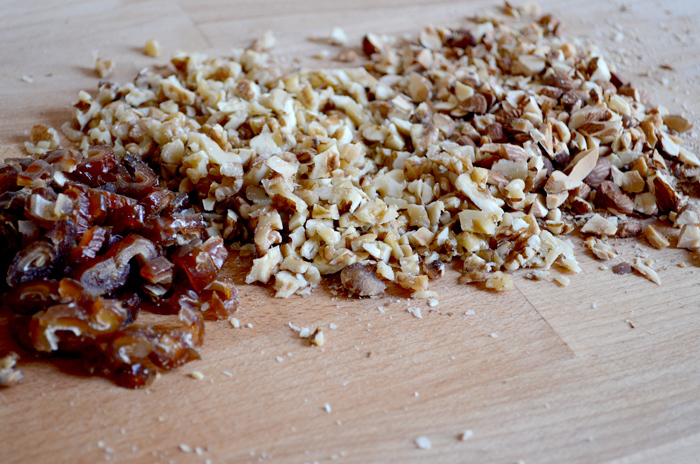 I actually love the texture of cutting through walnuts so I’d probably still choose to chop them by hand(I think Jamie Oliver has a similar affinity for cutting mushrooms). 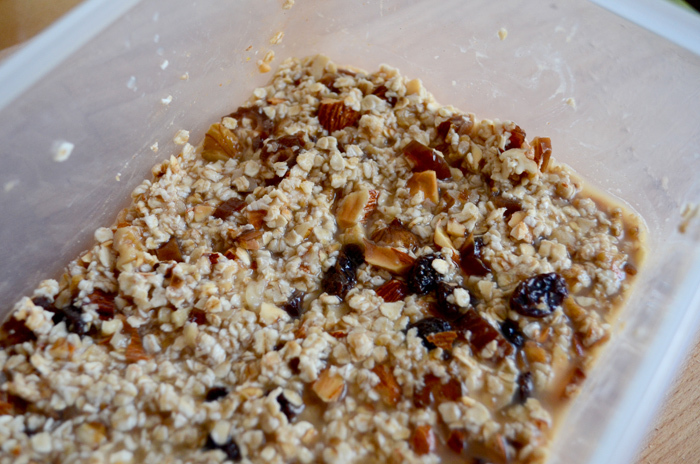 Place the oats, dried nuts, and cinnamon in a sealable container and mix thoroughly. 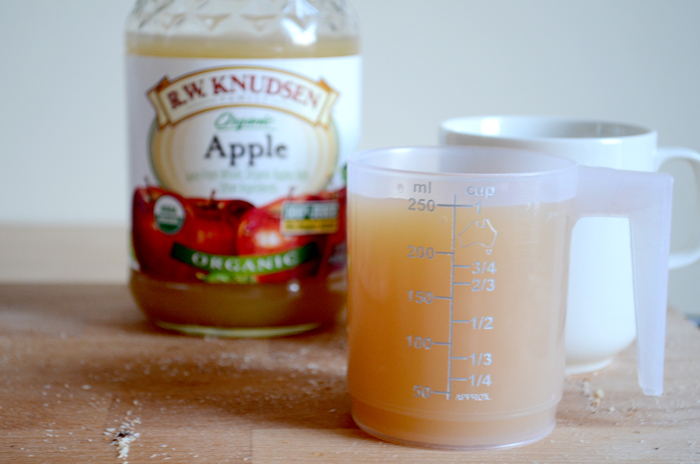 Warm the apple juice in a microwave-safe mug, about 30 seconds. If you’re using almond milk, this can be added cold. Add the apple juice a little at a time, depending on the dried fruit and nuts you are using you may need to adjust the amount. The grains should be covered and there should be some excess liquid around the edges. Let it stand to cool, then mix the mixture and place in the fridge overnight. Serve cold or warm, with fresh fruits, yogurt and a drizzle of honey.